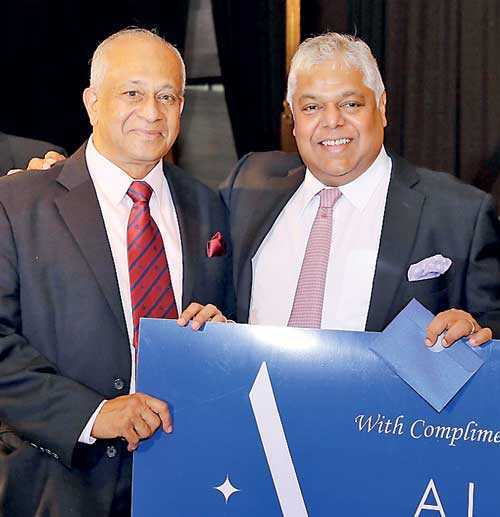 The Colombo Club, one of Asia’s oldest and most prestigious social clubs, held its 147th Annual General Meeting and dinner recently with corporate sponsorship from Altair, Sri Lanka’s iconic twin tower condominium development. This was the third consecutive year that Altair sponsored this exclusive gala event. Founded in 1871, the Colombo Club has 425 members of which 31 are life members. The club has reciprocal arrangements with 52 exclusive clubs in Asia, Europe, South Africa and the United States. In the picture, Club member Kumar Nadesan, who won two Business Class tickets to Singapore, receives his prize from Altair Director PradeepMoraes.